An electric field can be thought of as a “condition in space” emanating from an electric charge and extending throughout the whole of space. Restated with Feynman’s exact words italicized and my additions bracketed: From an electric charge [the point of disturbance] emanates an electric field thought of as a “condition in space” [that] extend[s] throughout the whole of space. Restated again to include bolded terms from Quadernity: From the point of its causal disturbance, an electric charge OUTforms a field thought of as a “condition in space” that extends throughout, and INforms, the whole of space. Without changing Feynman’s intention, Quadernity has brought to light what Feynman did not overtly state, but what he could not deny: OUTformation of a wave provides INformation about the location and strength of its causal disturbance. A pebble disturbs an otherwise placid pool of water. Waves propagate outwardly until the energy of disturbance has been fully exhausted. In the photo below, the waves appear as concentric circles, radiating from the source of disturbance outward to the pond’s periphery. Animated below is a mechanically devised sculpture of the concentric rings we commonly see on the water’s surface. About 20 seconds in, the video reveals transverse waves hidden below the rings. Waves issue from excess energy introduced by the disturbance. As the energy of disruption is depleted with each successive wave, the wavelengths grow longer and the amplitudes get shorter until the lowest energy state of the medium is restored. As pictured above, the pebble hit the water at an angle perpendicular to the water’s surface. The point of maximum disturbance can be represented by a vertical line, as compared to the undisturbed water, which could only be indicated by a flat horizontal line. Everything wants to return to Rest in the quiescence of its ground state. To that end, waves carry away/discharge/dissipate the excess energy of any and all disruptions. The propagation of waves continues until the lowest energy state is reclaimed. Permanently avoiding all disturbances is impossible in the physical realm. If we traveled to the remotest place in the darkness of deep space, a background of vacuum energy pervades the universe. The Zero Point Energy (ZPE) Field is the name given to laboratory-created vacuums, from which essentially all heat has been extracted. Both vacuums remain full of fleeting fluctuations/disturbances. We began with Feynman telling us that energy from a charged particle dissipates through classical wave-fields, and now we are considering how, in a vacuum once thought to be devoid of energy, fluctuating energy levels (think wave-field) can cause virtual particles. These two situations are mirror opposites: In the classical world a charged particle produces a wave-field; and now we learn that in the quantum world a vacuum field of fluctuating energy levels produces particle pairs. In 2008, physicists confirmed that most of the mass of the atomic nucleus comes from virtual particles, like quarks and gluons, that collectively add up to being classically charged particles, like protons and neutrons. The line between quantum and classical physics has been blurred! 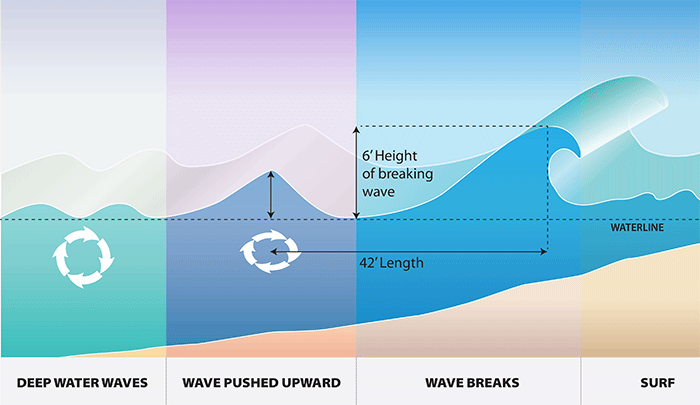 As waves advance from their point of origin, their leading edge is called a wave-front. If the disturbance causing the wave is moving, the wave-front will be more parabolic than circular, as seen below. 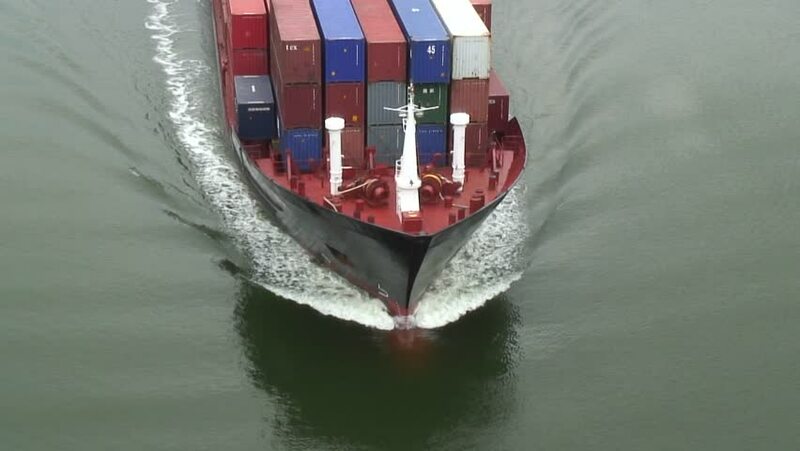 The parabolic wave-front of a moving boat is called a bow wave because it forms at the bow of the ship. A shock wave occurs when there is a sharp change of pressure in a narrow region. When a plane flies faster than the speed of sound, we can hear its shock wave, just as we can hear thunder caused by lightening. 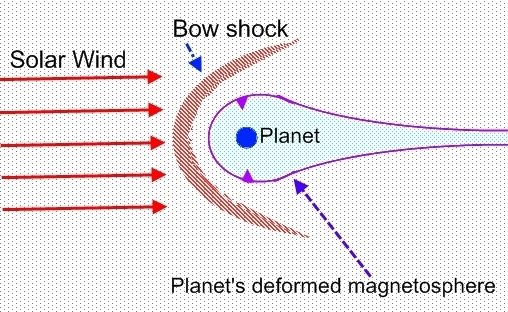 Stars and planets zip through the solar system, producing shock waves. These are called bow shocks because their shape is similar to the bow wave of a boat. 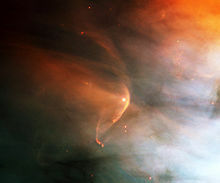 Photo on left above came from Hubble, 1995, via Wikipedia, who provided this description: LL Orionis bow shock in Orion nebula. The star’s wind collides with the nebula flow. 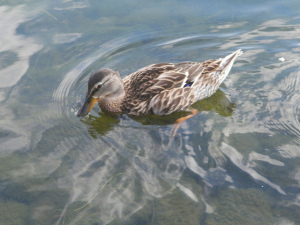 In the image below, ripples arc around a duck whose forward movement is preceded by a subtle bow wave. Have you ever had a hunch to take an action which helped you avoid a mishap? Precognition, so often regrettably disregarded, arrives as a subliminal influence from a subtle, yet INformative, wave-front. Where shock waves form, electric current flows. Where electric current flows, magnetic fields are formed. OUTformed waves INform their fields. [T]he shock wave is a sharp discontinuity in density. Where the density is higher, of course, there is more matter, so a higher concentration of ambient ions are there, naturally raising charge density in the shock wave. The temperature is higher too, so that causes ionization in the shock wave. There is higher pressure, so particle collisions are more frequent, again ionizing the shock wave. … [T]he large electric current in the shock wave … is self-amplifying. As ionization frees electrons to roam, they knock away more electrons in a runaway chain reaction. A field’s wave-front then OUTforms more waves, which further INform the extended field, and so forth. The field grows, generation by generation. 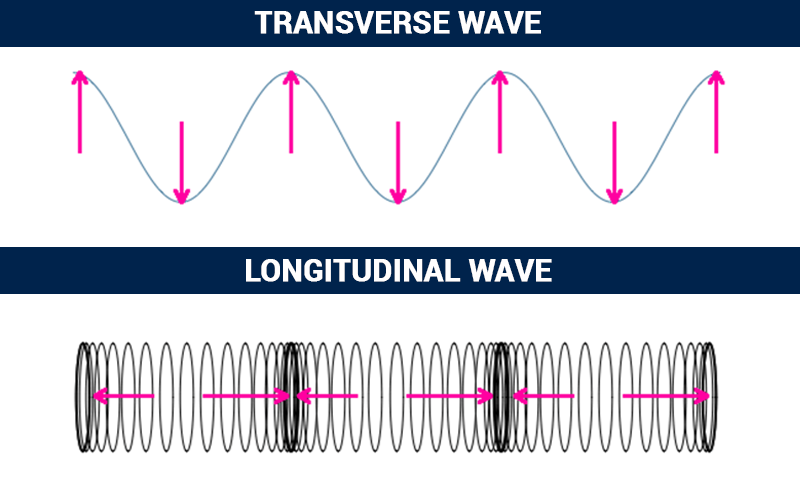 Huygens’ principle states that the points tangent to a wave-front (tangential points = pink dots, wave fronts = blue arcs) may become a source of new wavelets (smaller white arcs). The new “wavelets” expand the spherical wave-front until the wave field “extends throughout the whole of space”, just as Feynman declared. What is considered a wave-field (fronted by blue arc) from one perspective could be considered a particular disturbance (pink dot) from another perspective. Scale affects one’s point-of-reference. The fact that the electromagnetic field can possess momentum and energy makes it very real … a particle makes a field, and a field acts on another particle, and the field has such familiar properties as energy content and momentum, just as particles can have. Typically, a particle is thought to be a small localized object or a minute bit of matter; a wave carries energy throughout a relatively widespread area. According to Feynman, not only do particles act on fields, but fields also act on particles. So either a particle or a field can be a disturbance; and at some other time either could be the one that gets disturbed. Additionally Feynman tells us that fields and particles possess similar properties. By revealing these two facts, Feynman has blurred the lines between particles and fields. 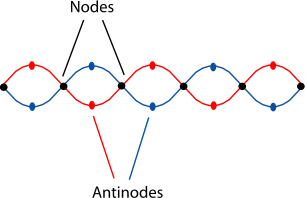 The particle and wave are differentiated attributes of a system that comprises them both, and from which neither can be detached from the other. To coin a word that can be used generically to represent any particular entity that has made a difference/a disturbance/a disruption, no matter whether that entity is a particle or a field or anything else, Quadernity contracted the words ‘particular’ and ‘entity’ to get the utilitarian term ‘Particularity’. The nouns particle and Particularity are related but not exactly synonymous. The relationship between the disturbance and the disturbed is that which establishes something-in-particular; in other words, the Particularity is defined by and dependent on the encounter. You simply cannot say, or even calculate, where an electron is in an atom or where it will be. You can only give the odds of its being here or there. And it is not here or there until you look for it and make a measurement of its position. Only then do you get an answer, and all the other possibilities just disappear. This is a difficult point to grasp, but it needs to be clear. It’s not just a lack of knowing the electron’s “real” position. The electron does not have a real position until somebody (or something) measures it. A Particularity is an outcome of the relationship between two potentialities, the potentially INformative party (that which can disturb something else) and the potentially INformable party (that which can be disturbed by something else). Having read the preceding units, especially the chapters on the chalkboard models of Creation and Information, will improve comprehension of what remains in this essay. Even as a refresher before proceeding, the summary in Quadernity’s Essential Vocabulary : Feedback of OUTformation and INformation would be helpful. The INformative disturbance gets defined/measured by the particular way the INformable gets disturbed. To standardize this relationship on the map of Quadernity, the INformative is always in the Lower Right Quadrant, whether it is an electron, a pebble, a wave field or any other potential disturbance. This LRQ is associated with the Female archetype for Created Corporeality. The INformable is always in the Lower Left Quadrant, whether it is a scientist, a pond, you the reader, or anything else that can be disturbed or distracted from the Rest state. The LLQ is associated with the Male archetype for Consciousness. From the encounter of the INformative and INformable emerges the OUTformed, or Created Particularity (LRQ, Female). The higher-order Participation, during which context (the INformable’s reaction) is ascribed to content (the INformative disturbance), is Quadernity’s Creator (LLQ, Male). During the moment of mutuality — the lower-quadrant relationship — the Female INformative (LRQ) becomes the corporeal Created, and the Male INformable (LLQ) becomes the conscious Creator. In physics, the metaphysical upper-quadrant relationship between the Female and Male archetypes is overlooked, leaving many an unsolved problem on the table. The pebble and the waving pond are linked, as are the idea of a wave-field and our contemplation of it. The pond will emanate waves until the energy absorbed by the falling pebble is exhausted. We will consider the wave-field with curiosity until no more novelty is derived from the exercise. When the disturbance is no longer INformative, or the INformable is no longer interested, either way, the feedback by which the Particularity persists will cease. As long as the feedback continues between the Female and Male conspirators, the quantum system remains in tact. Strange as this may seem, this is proven experimentally. As discussed in a previous Aside: The Holarchy, Particularities are composed of smaller and smaller Parts, and Particularities also Participate in greater and more complex organizations. Within the infinite hierarchy anything that qualifies as a Particularity can be assigned to that role. In the chapter, Quadernity’s Nature-Based Number Line, the Particularity is the central unit; it comprises Parts in one direction and it Participates with higher organizations in the other direction. The Particularity is assigned the numerical value ‘1’. Fractions represent the descending Parts and compound numbers represent ascending levels of Participation. Fermions are disturbing little matter-particles. The fermion’s INformative field is thought to be mediated by bosons, or force carrying particles (or are they waves?). 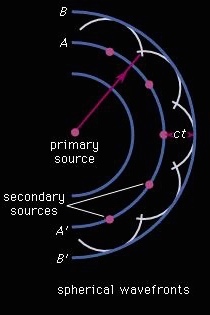 The boson-field of a fermion merges with the boson-field of other fermions. How can we say that photons (bosons) or electrons (fermions) are separate little particles in space if they are part and parcel of the electro-magnetic wave-field? Remember, within the field, an INformable entity must register the INformative particle/wave for it to become a specific Particularity. The late, great American physicist, John Archibald Wheeler, describes the feedback of matter/space in the same way as we have been discussing the particle/wave, as a unified system. Space acts on matter, telling it how to move. In turn, matter reacts on space, telling it how to curve. The Hubble telescope gave us the knowledge that space is expanding at the far reaches of the visible universe (at its wave-front). We would expect this to be true if what we call space is the composition of intermingled INformative fields that are ever-growing and overlapping each other. The rippling of the interconnected boson fields is the likely solution to the super-luminal problem of Einstein’s spooky action at a distance. There is no rule about how fast space, itself, can expand or contract. Each wave extends from one of countless points of disturbance and spreads outwardly. Multiple waves, or vibrations, create complex structures by way of constructive and destructive interference. The linear wave forms above are only a 1D representation of a 3D phenomenon, the wave-field. 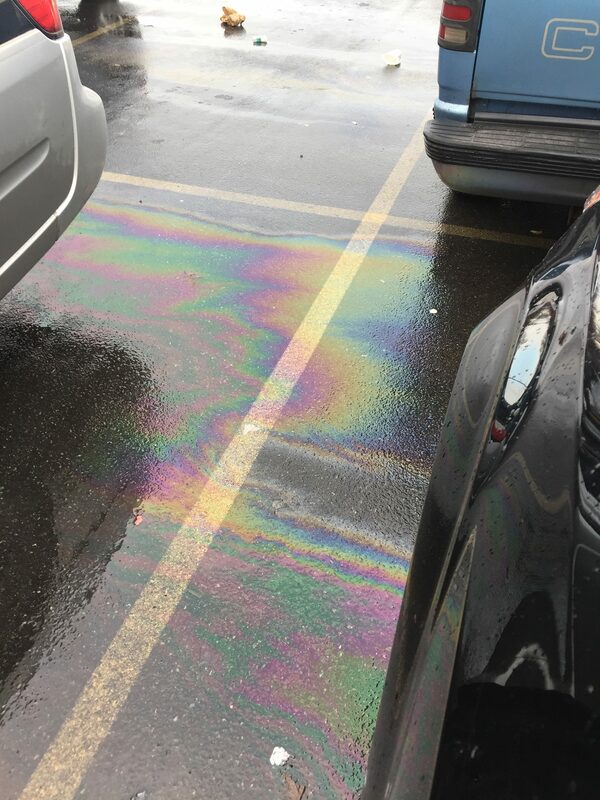 By spectral density analysis the red 3D wave-form has been reduced to a 2D image on the surface below it, which looks similar to the way light reflects off the oily surface of a parking deck, or even off the surface of a soap bubble. White light is composed of all the colors of the rainbow, each of which has a different frequency, making them reflect from the surface at different angles. This is what allows us to separately see the different colors of light. The refraction of light in a prism also breaks up white light into its spectrum of colors. Compare the 2D spectral density analysis to the outlines of high and low pressure zones affecting weather in the USA on a given day. 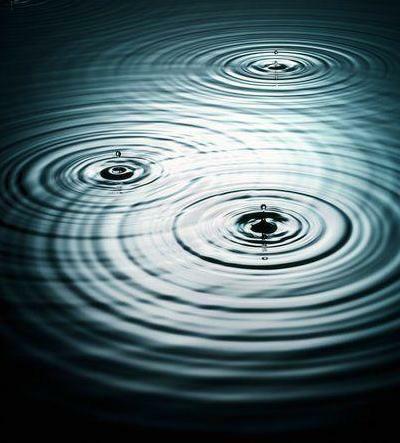 In the photo below, a raindrop strikes a placid pool of water and concentric circles emanate from the central point of disturbance. What is not obvious in this photograph is that the field of disturbance indicated by the propagating water waves is actually spherical. In the situation we are considering, the spherical wave-field has two forms of media: water in its lower hemisphere, and the air in its upper hemisphere. Though waves pervade both media, they are most noticeable near their source of disturbance; this is because they attenuate by the inverse square law. Below and above the visibly rippled surface, creatures are INformed by the OUTformed field. Below the water’s surface, a bowl-shaped wave-front moves outwardly from the point of disturbance. Fish and other water-borne critters inhabiting the lake may have a palpable, visible and/or audible experience of the wave. By interpreting their sensations, the waves become meaningful and beneficial. If the waves indicate something edible has entered their field, they move toward the central disturbance. If the waves indicate something dangerous has invaded their space, they move away from the disturbance. 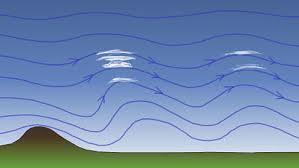 Above the water’s surface, a dome-shaped wave-front expands through the vaporous air. In this relatively low-density medium, the waves are ordinarily too weak to shove macroscopic objects around. The microscopic particles that do get carried through the waving air are below the threshold of human eyesight; so, instead of seeing the movements of such a wave, sound waves of alternating pressures vibrate our eardrums. Sky-creatures, like birds and insects, likely have developed multiple sensitivities that allow them to detect even the subtlest of waves in their domain. The sensations of feeling (in beings below the surface) and hearing (in beings above the surface) are instigated from pressure waves caused by the same disturbance, in this case the intrusion of an object into the lake. OUTformed Waves are a source of INformative signals. When we hear a sound, we are able to determine the general direction from which it originated. 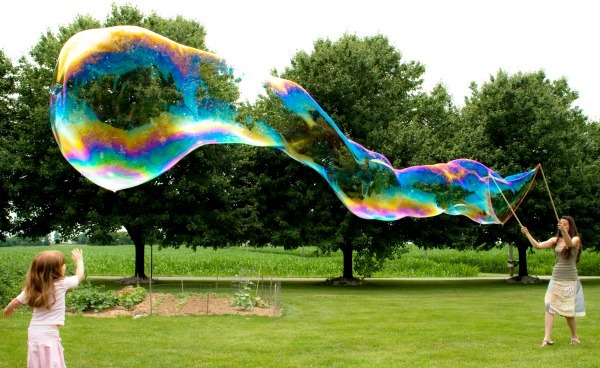 Like me, you may have assumed that sonic waves travel through the air, as if carried by a breeze. Although we saw waves as concentric circles on a 2-dimensional surface in a photo above, and as layers of 1-dimensional sine waves in the drawing directly above, in neither case are we seeing the waves in their entirety. 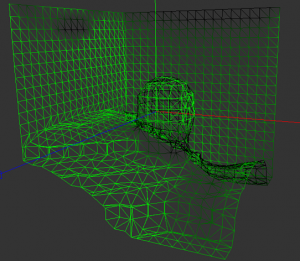 These waves actually extend omnidirectionally throughout 3-dimensional space. 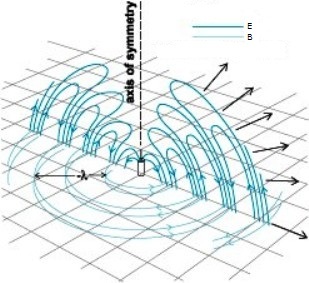 Below are graphical representations showing how the electric and magnetic fields (E for electric and B for magnetic) propagate at right angles to each other. Energy dissipation pours out in all directions, creating a field of disturbances in a medium, such as those seen below. Note: Waves should be distinguished from the medium through which they traverse: ocean waves are not made of water molecules and sound waves are not made of air molecules. 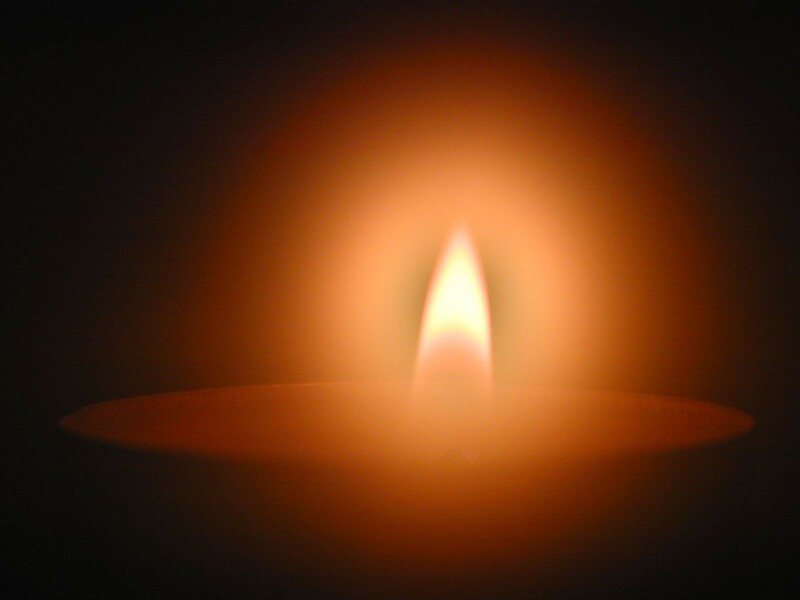 On the left, energy from a candle flame dissipates omnidirectionally, infusing the surrounding air with electro-magnetic waves; this process is known as incandescence. 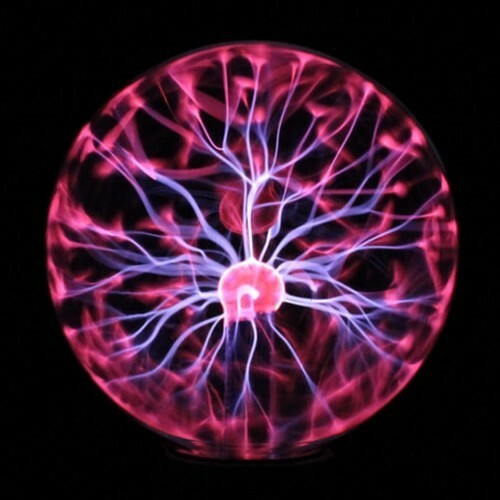 On the right, within a glass globe of vacuum-pressurized neon, a centralized source of radio-frequency energy induces plasma filaments to randomly stretch out in all directions to the extent of the insulating bulb. Similarly, sound waves travel outwardly in all directions from their source. 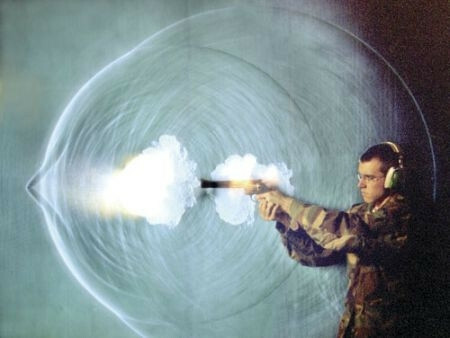 A special kind of photography called Schlieren captured the bow shock of a bullet, along with its spherical sound wave. 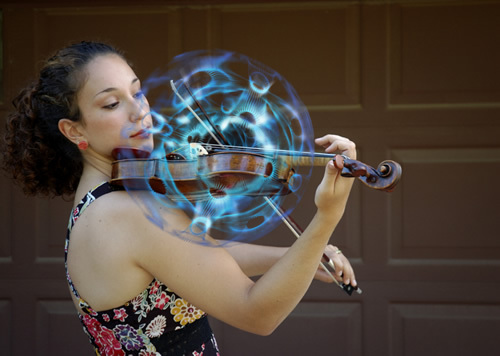 Beginning at the point where a bow initiates vibrations in taught violin strings, a spherical wave field forms. 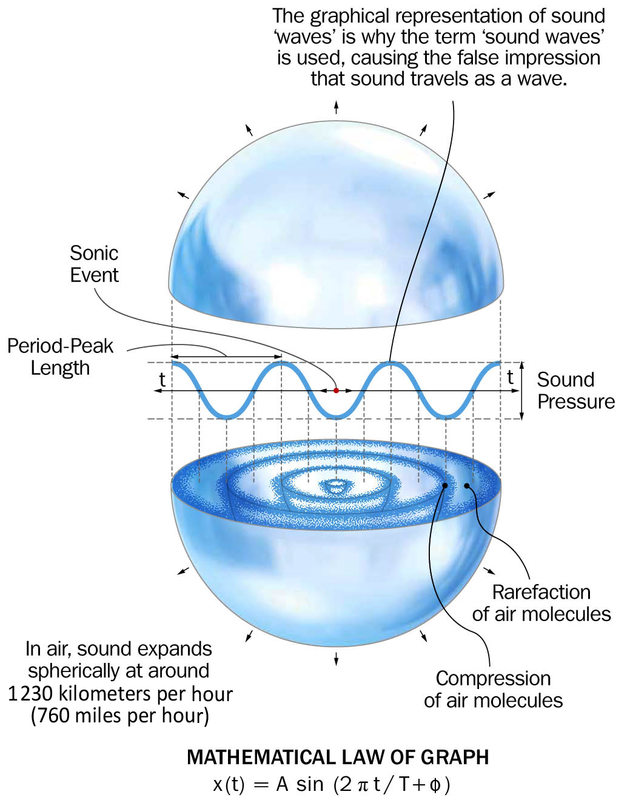 As depicted in the photo above, sonic waves form a spherical field in which air molecules are compressed together or spread apart. Reprinted below, side-by-side, for your convenience, are two illustrations from above. Notice the terms ‘compression’ and ‘rarefaction’ (lower right corner of sketch, below left) and follow the arrows to the cutaway. Compare the cutaway to the familiar concentric waves in the photograph, below right. The sine wave is meant to serve as a linear representation of the pulsing pressure variations occurring within the field’s medium. Whether in air or water, or in any other medium, waves alternate between Pulling particles together (compression) and Pushing particles apart (rarefaction). For a brief lesson on why the particles collect in places called nodes and evacuate elsewhere check out this tutorial on standing waves from Khan Academy. Below, the fascinating TED talk about cymatics demonstrates how the pitch of a sound, when pulsing through a metal plate, causes granules to accumulate in some areas and to evacuate other areas. The macro-particles distribute in a specific pattern upon the plate’s surface, the higher the pitch, the more intricate the pattern. We will see in the next video, just below, that ferrous fluid, forms conical structures in response to an applied magnetic field. 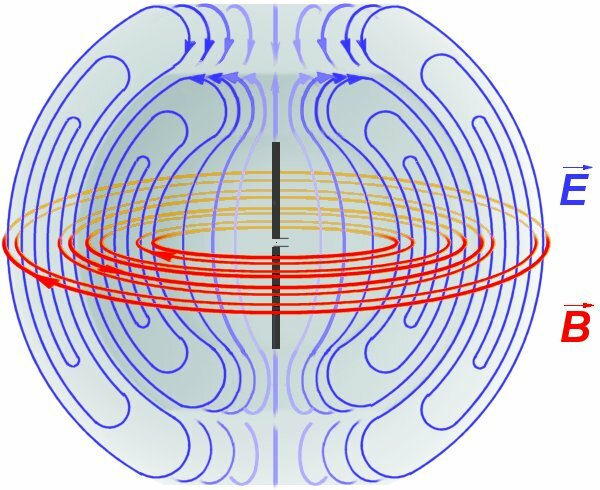 The cones are biggest at the source of magnetism and taper to a point as the field-strength weakens. Because the ferro-fluid has viscosity it coated the peaks of waves as well as settling in the nodes as did the granules on the metal plate. 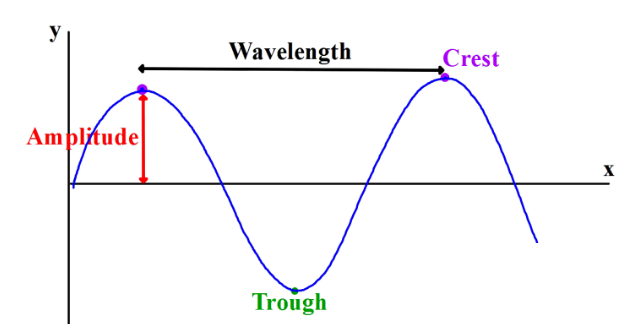 Water waves exhibit crests and troughs; they are transverse waves (see below). Sound waves exhibit compression and rarefaction; they are longitudinal waves. Within all the fields, compression and rarefaction alternate, creating areas where particles tend to gather and areas where they tend to avoid. Below, the snake contracts and extends in order to move forward. 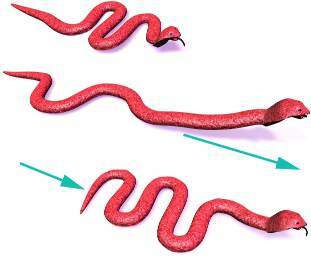 In the video below, the snake climbs the tree by coiling and uncoiling. Both snakes above are behaving as longitudinal waves. 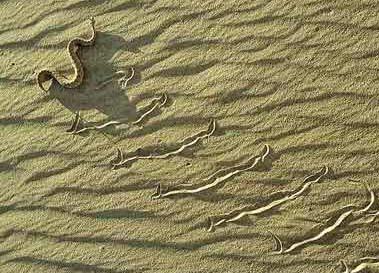 The snake below is behaving as a transverse wave. Its movements are perpendicular to the direction of its advance. Without surface tension, the energy of an initial disturbance would be expressed as an immediate explosion. Impact vs. tensile strength determines how much energy will be released explosively at the surface and how much energy will be time-released in pulses of after-shocks, traveling as sub-surface waves. 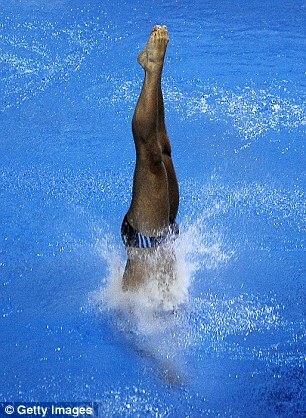 A skillful diver enters the water perpendicularly to reduce the area of impact and thereby minimize the explosive splash. Wherever the pressure to release energy carried by a wave overcomes the surface tension of the medium through which the wave traverses, the wave breaks and an explosion occurs. For example, waves approaching the shoreline encounter an ascending ground, which obstructs the forward flow of the wave. As soon as the tensile strength of the water’s surface is unable to constrain the energy built up by compressing the wave, the wave “breaks” and explosively releases its left over energy. Instead of bobbing up and down on gentle, transverse bay waves, as I am wont to do, a surfer thrills at being thrust across the water’s surface by the energy of a big breaking ocean wave. To ride a wave the surfer seen below has caught the sweet spot between the wave’s crest (maximum height) and its looming break (forward pitch). He successfully capitalizes on the explosive energy just behind him and swiftly sails forward. At our human scale, in breaking ocean waves, air and water molecules exchange atoms. Subatomic particles are also entangled in the mix-up. What happens at the cosmic scale? Perhaps the frothing mass of stars we call a galaxy could be thought of as breaking cosmic waves, which have encountered severe pressure variations in the plasma at the black hole horizon around which the galaxy is centered. Certainly, the same sort of destruction and recombination of materials occurs in both cases. Aside from scale and substance, the breaking of sea waves and cosmic waves are quite similar. With each breaking beach wave, some frothy mineralized water escapes the undertow of the sea and seeps into the protection of the sandy shore. Similarly, some quarks and ions escape the tumult at the horizon of the black hole. Being subject to the relatively low pressure just beyond the event horizon, these particles are at the effect of an intense divergent Push. Such high-energy particles interact to form rare and rudimentary elements, of which solar systems (including our own) are built. Consider the supernova. The italicized statements below are from Wikipedia. My comments follow each statement. Super novae are triggered either by the sudden re-ignition of nuclear fusion in a degenerate star or the sudden gravitational collapse of a massive star’s core. The above statement confirms that waves break suddenly at the horizon of a black hole. 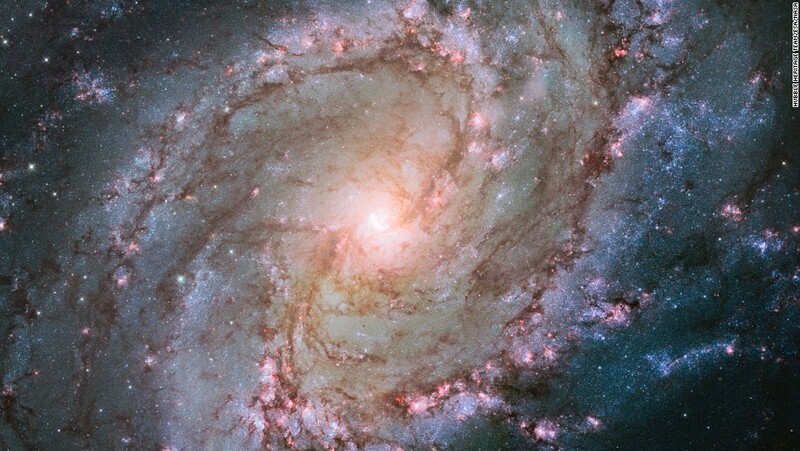 Supernovae create, fuse and eject the bulk of chemical elements produced by nucleosynthesis. And this statement confirms that the galaxy of solar systems surrounding a black hole could be formed from residual elements escaping from, or being thrown from, broken cosmic waves. The expanding shock waves from supernovae can trigger the formation of new stars. Some stars become supernova and some supernovae make stars, just as seeds grow plants and plants grow seeds. 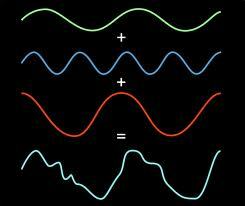 And according to the aforementioned Huygen’s Principle, waves form wavelets. Particular disturbances make waves, and those waves, in particular, make further disturbances. The entire universe is a recycling machine, and operates similarly at every scale. Realistic holograms can be made from interference patterns of light waves that were exposed to objects in 3D space. In similar fashion, sensory dissonance can be used to visualize the sonic occupation of a given space. The blind man in the next video has learned to see by echo-location! Synesthesia is a condition in which the senses get blurred together. In the synesthete, for instance, a number can evoke a shape or a color. Touch stands in for eyesight when the blind learn to read braille. How could one kind of sensory input ever stand in for another kind, in order to produce equivalent knowledge? How can one be trained to accurately interpret alternate stimuli when the more usual kind is unavailable or inaccessible? The correspondence we establish between symbols and concepts, for example, letters for sounds, sounds for feelings and thoughts, and numbers for categorized items, to list a few — is quite similar to how we derive knowledge, and construe entire realities, out of vibrating patterns of light. Conceptualization is a habit, automated by conditioning and practice. This is true also when it comes to the patterns we recognize, and the manner in which we access our personal knowledge. Our capacities for learning are not as fixed as we may believe. If we can reprogram ourselves as to how we receive impressions, we can surely reprogram ourselves and as to how we interpret and react to those impressions. We are the INformable, bathed in an INformative field. OUTforming waves are constantly INforming the collective consciousness. 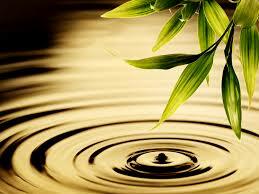 Through resonance, we can remember knowledge long ago memorialized in our wave-field. Neither distance nor time prohibits our access of what wisdom-keepers have recorded for our retrieval. Light is the universal INformer. The enlightened use receptive resonance to access its records, known as the Akashic Records. We are both INformed by the Electro-Magnetic Field in which we live, and we, in turn, OUTform the field. We are always awash in our own projections; the immediate feedback is known in eastern traditions as karma. How do we finally escape the ups and downs of a life in the waves? How do we find our ground state and Rest there? Without interactions between various particle/field combinations, there could be no experiences and, thus, no meaning made of them. Without taking measure or making meaning of stimuli, disturbances lose their status as Particularities; they cease to be particular entities in our personal reality. A wave is made of salty seawater, however, it is temporarily differentiated from the sea, defined by its specific form and behavior. At the shoreline, the ocean reclaims the wave’s watery substance; the sea and its rhythmic tides are thus reintegrated. When two people witness an identical scene, they will first see the scene as a whole because they have the sense of sight; and then, almost immediately, each of them will actively look at the scene and single-out what is familiar, what offers a comfortable amount of novelty, and/or whatever interests him/her the most in that moment. The two individuals, having singled-out patterns of their own accord, will associate, or mingle in, these patterns with other preconceived patterns that reside within their own resonant memories. Consequently, each will have a different experience, and each will claim a different reality. 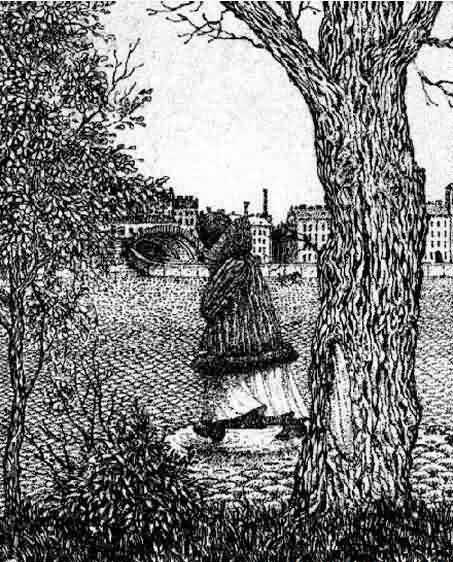 Both individuals see the same scene, yet as each looks at different things they create different realities. In the image above, did you first encounter the city-scape or the face? The counted object and the discounted background are inextricable. We can go quickly back and forth between the two views; however, holding them simultaneously is not possible. Each individual makes real what he/she counts, and makes unreal what he/she discounts. Realities are, therefore, private and personal. The object unfolds in the forefront of our mind, while the background is enfolded into the recesses of our mind. The things we observe are singled-out from a background that contains all the things that we could possibly observe but do not — those things that remain mingled-in. Dualities are paradoxical because they consist of two mutually exclusive (unfolded/differentiated/singled-out), yet mutually dependent (enfolded/integrated/mingled-in) features composing a single higher-dimensional state. Atoms unfold from a sea of subatomic particles to be enfolded into molecules. Molecules unfold amidst countless atoms to be enfolded within cells. Cells unfold from diverse molecules to be enfolded in bodily tissues. Organ systems unfold from these tissues and are enfolded in the whole organism of a living creature. In every moment, we living beings are unfolding from the transcendent biosphere, or web of life, and enfolded in the Eternal Comprehensive Perfection. What is unfolded, is enfolded, like a wave crashing on the shore is ineluctably resorbed into the body of seawater, whence it came. The ocean waves are made of salty seawater, however, they are temporarily differentiated from the sea, as defined by a specific form and behavior. At the shoreline, the ocean reclaims the wave’s watery substance; the sea and its rhythmic tides are thus reintegrated. Waves which spring from the static ocean surface toward crests and troughs do not unite to reproduce another wave; they withdraw into the ocean surface. Each wave is new; it is not a repeat of a prior wave. Every moment is new; what we unfold is up to us. As we unfold an impression in the forefront of our mind, its background remains enfolded in the recesses of our mind. The things we observe are momentarily singled-out from a background that contains all the things that we could possibly observe but do not. The unselected potentiality remains for that moment mingled-in, undifferentiated. Having and not having arise together. Whatever we have made of ourselves, all other possibilities remain. Our well-worn paths will fork off into a new direction whenever we choose. Everything that unfolds has the opportunity to be enfolded into a higher level. The rise and fall, the unfolding and enfolding of bodies and minds, eons and cultures, species and specialties, signify an evolutionary journey of selves returning to Self. Do not believe for a minute that humans are unfolding from some miraculous web of life, only to be enfolded back into it at the same level, as if we are like kneaded bread. No! As unfolded humans, we are capable of intentional evolution. We are unfolding so that we may be enfolded into a higher phase of life. This should be our primary undertaking. As complex beings, we humans are conscious of being conscious. Therefore, we can use our minds to transcend our minds! As we drop our obsessions with how we are unfolding, we begin to welcome our enfoldment. How we react to the field in which we find ourselves becomes a secondary OUTformation to which others will react. If we resonate with the disturbance, we provide constructive interference and the wave’s amplitude grows, leading others to more intense reactions. Thus, the perpetuated wave OUTforms as a field of INformative signals. If we negate the disturbance, we provide destructive interference and the wave’s power to influence others is diminished. Yogi masters encourage us to transcend the waves. If we, ourselves, are undisturbed, we shall not produce or propagate any further disturbances. Were it not for disturbances and obstructions, homogeneity (unified substance) and equilibrium (neutrality of forces) would prevail. Disturbances that create changes in space (LRQ) and, in time, get the attention of conscious observers (LLQ) must be transcended in order to Rest in homogeneity and equilibrium. 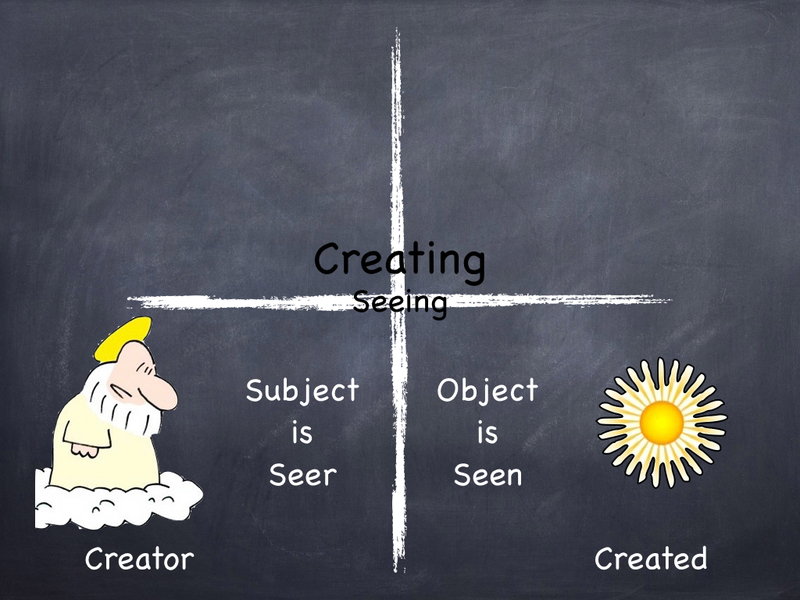 Task the self-reflective consciousness (Upper Right Quadrant) to break through conditioned concerns and limited perceptions of reality (Lower Left Quadrant). Transcend the rational mind to reach the irrational Oneness of ECP. we refuse to amplify existing disturbances or to create new disturbances. At long last, we witness ourselves enfolded in the Eternal Comprehensive Perfection. Om Shanti. Light is what enfolds all the universe… Light in its generalized sense (not just ordinary light) is the means by which the entire universe unfolds into itself.